Why Should I Sell to GoldSilver Instead of a Coin Dealer or Pawn Shop? Can I Use Bitcoin or Other Cryptocurrencies to Buy Gold and Silver from GoldSilver? What Do I Need to Know Before I Sell Gold or Silver to GoldSilver? Can I Sell My Gold or Silver to GoldSilver for Cash? When I Sell to GoldSilver, What Ways Can I Receive Payment? 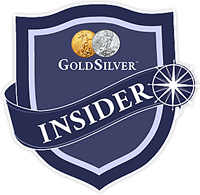 Which Credit and Debit Cards Does GoldSilver Accept? How Do I Pay for Gold or Silver by PayPal or Venmo? How Do I Pay for Gold or Silver by Bank Wire? Why Should I Buy Physical Gold and Silver When I Can Buy Shares of a Gold or Silver ETF? New Mike Maloney Interview: "The Central Banks Get Special Set of Laws to Steal Our Wealth"
The Morgan Report: "US Dollar Demise This December?" The Chris Martenson Interview of Mike Maloney: "One Hell of a Crisis Looms"